For some reason I was nervous about sewing the Hanami dress that I was given by Perfect Pattern Parcel. It had been on my list of ‘things I’d like to make one day‘ for ages. But I wanted to gain a bit more experience before I took it on. I had seen other peoples creations and I wanted mine to be just as impressive. I bought some stunning taffeta from Walthamstow market, it was the last 2 and a bit meters on the roll so I really couldn’t afford to make mistakes. The fabric reminded me of the something Vivienne Westwood might use (one of my favourite fashion designers). Or Jessie and James, who I am completely inspired by. I just wasn’t sure if I was ready for the Hanami dress yet. It actually intimidated me like no other pattern has intimidated me before. When I saw this dress on Pinterest, I completely fell in love with it (especially the pleats). If you click on the link and scroll down you can see the comment I made a couple of months ago. But last month, luck was on my side, only days after receiving the pattern, An from Straight Grain posted a tutorial on how to do three types of improvisational pleating. The ‘origami path’ remained my favourite. The pleating was surprisingly easy, but I messed up twice with the sizing. In the end I had to make my calculations 2cm wider in order for the bodice to be the correct size. But now I’m panicking just a little, hoping my fabric would last the distance. Printing out the pattern wasn’t as straightforward as I hoped. Some of the pages were portrait and others were landscape, so when I printed them out in one go, some of the pattern was missing. I didn’t realise this until I started piecing them together and wondered why I was left with gaps. It was not the most obvious of pattern jigsaws to put together, but I got there in the end. The bodice and the tulip sleeves came together really well and I began to relax. (Maybe a little too much.) When it came to attaching the skirt I cut out my fabric to the size specified. I stitched the side seams together and it was clear that the skirt was far too narrow. Darcy would have to walk like a geisha if I left it at that size. Panic struck me once again as it dawned on me that I was slowly running out of fabric. I measured what I had left and fortunately I was able to add an extra 30 inches to the width. Hold up! 30 inches? that’s double what was indicated in the instructions. Erm! Should I have cut the fabric on the fold? Dammit! That was what I was suppose to have done. BIG FAIL! With the correct length of fabric now cut I began to regain my composure. And composure is just what I need for the gathers that were to follow. I’d completed the gathers on the sleeves, but they were a sprint compared to the marathon ahead of me and I wasn’t sure I had the stamina for it. 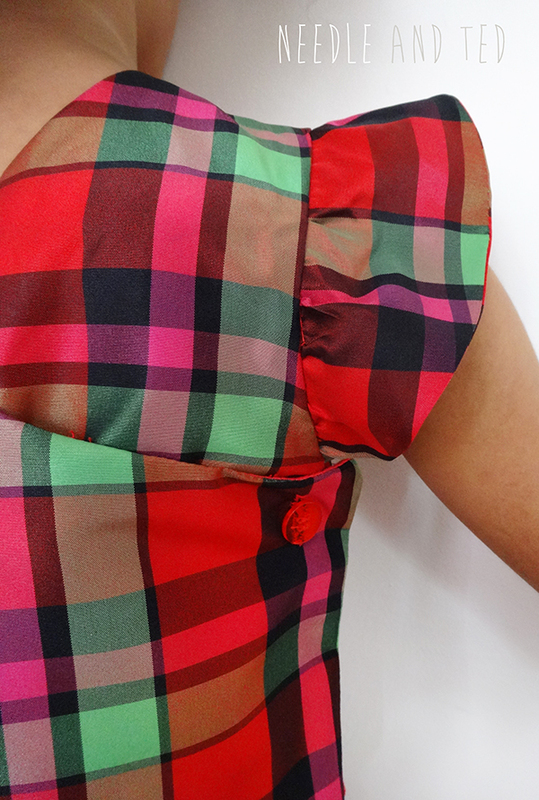 With a lot of care and concentration I managed to attach the gathered skirt to the bodice without any major problems. With a big exhale and a sigh of relief I was nearly done, home and dry. Just the buttons left to do. I say ‘just the buttons’, but button holes fill me with dread. This could be the downfall of what was turning out to be quite an exquisite dress. Now I was about to cut holes in the fabric. One false snip and it would be ruined. I suddenly had a brainwave. I went to the cupboard to check the instructions for my sewing machine. You may be shocked to discover that I have never looked at the instructions before. Gasp! In the bag I found numerous extra feet that I never knew I had, including…. (wait for it)… a buttonhole foot. What’s more, I discovered the buttonhole lever which I never knew was hiding towards the back of my sewing machine. I am still amazed that I had never seen it before. Finding the buttonhole foot made sewing the button holes effortless. I even sewed the buttons on by machine, something I had never considered doing before. I could kick myself for not finding out about this months ago. September Tunic, I’m coming after you. Bring it on! Buttons attached I stood back to admire my handy work. My Hanami dress looks AMAZING and I couldn’t be more satisfied. If you would like to try your hand at sewing the Hanami dress I suggest you head on over to Perfect Pattern Parcel. Caroline Party Dress by Mouse House Creations You name the amount you are willing to pay, but if you choose to pay $24 or more you will automatically be sent the Prefontaine Shorts by Made with Moxie as a bonus. Perfect Pattern Parcel offer high-quality pdf sewing patterns by indie designers (independent designers). The funds raised from each Pattern Parcel sale goes to the charity Donors Choose. 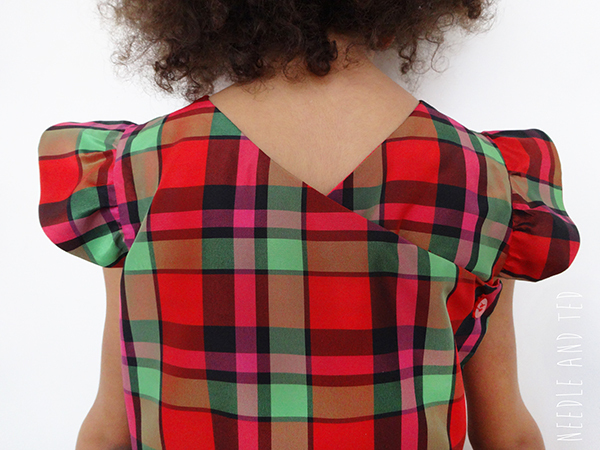 What did you learn from sewing the Hanami dress? Take your time, don’t rush and DON’T BE AFRAID. What new technique did you discover? Understiching, the instructions in the PDF were not completely clear to me, so I referred to my trusted ‘sewing techniques‘ Pinterest board and it all made perfect sense. What do you like most about the Hanami dress? Everything, absolutely everything. I love everything about it. I wouldn’t change anything about the dress, but I have changed how I feel about the Hanami pattern, I am no longer intimidated by it. I feel I may have gone up to that next level in my sewing ladder of accomplishment. And that feels so good. Will you use the pattern again? Oh yes, and I can’t wait. I would like to try a version in cotton next. 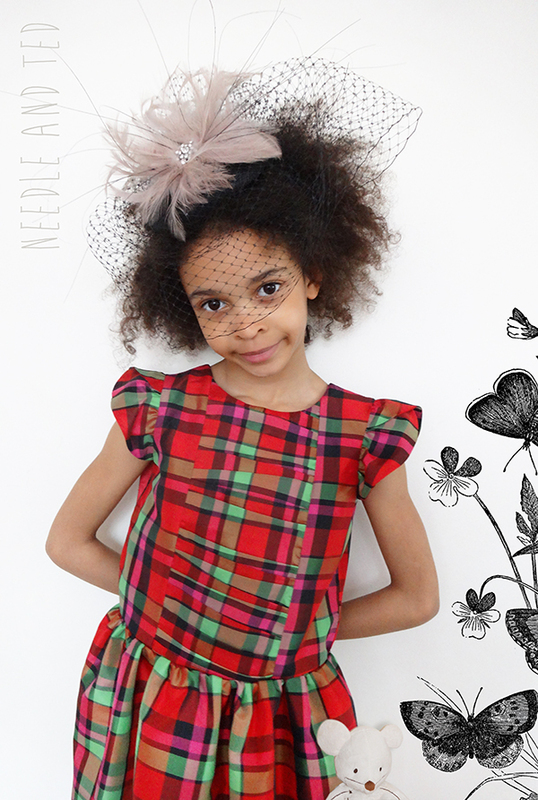 This entry was posted in Dresses and tagged children, children's clothes, dress, fashion, handmade, improvisational pleating, kids clothes, Needle and Ted, Perfect Pattern Parcel, sewing, taffeta. Bookmark the permalink. Thank you, I’ve just realised the tucks don’t look that obvious in the pictures. I may just add a close up. Otherwise the bodice might just look a bit wonky to some people. it’s totally amazing!!! and i can completely relate to the buttons thing… i’ve done the SAME EXACT THING! Thank you. I’m glad I’m not alone in some of the mistakes I make or the fears I have. Just stunning! I really really love it. 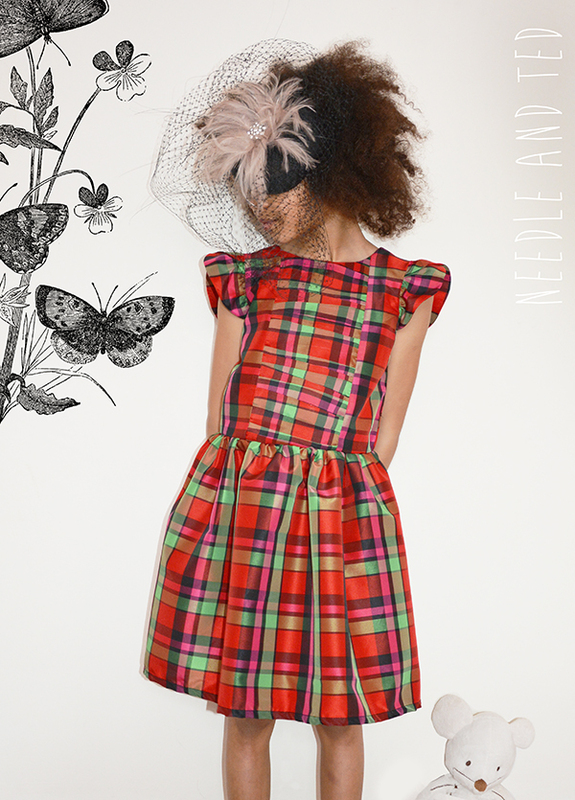 We are going to a wedding next weekend and I have made Caroline dresses for my two girls which are completely adorable….BUT…I now want one of these dresses that they can wear to the ‘night before the wedding’ dinner! I must admit at first glance I wasn’t taken by the fabric, but the more I love at it the more I like it. It is a lovely party dress. I especially like the pleating. Can’t wait to see what is coming next. I LOVE the pleating detail you added! What a great fabric to try that technique with. I avoid buttonholes at all costs (I’d rather sew a zipper- crazy right?) because my machine doesn’t do a very nice job of finishing them. I finally learned how to do a hand bound buttonhole recently for a coat I made and I love the look- but ugh it is time consuming! Great work on this dress! I am in love with this dress, like seriously! What a beautiful job you have done. Isn’t it amazing that whenever you only have a very limited amount of fabric, it’s pretty much guaranteed you will do something like not cut on fold or cut out a wrong size? So stressful!! I’m glad it all turned out so nicely. I was reading your story as a thriller – so many twists and so much suspense haha love it! The result was certainly worth it 🙂 Bonus – you now know you have a buttonhole foot hehe Those are awesome! I’m flattered that you saw my post as a thriller, it was absolutely my complete intension 😉 Not really but your comment made me smile. The dress is beautiful as is your daughter. I made one for the blog tour too, and I made two previously. I never had printing issues as you described. …maybe I was just lucky! I thoroughly enjoy your blog and definitely will be looking forward to what you sew in the future! Thank you, I’m hoping to sew some more Hanami dresses myself. I have just checked out your blog and my goodness, you must have tons outfits that you have made for your daughter, I am in complete admiration. You must have a sewing machine attached to the end of your arms. I wasn’t sure how to follow your blog though. I returned from a few days away with very little internet access, to find a bunch of gorgeous Hanami dresses! Thank you so much, it feels so special to hear that you like my Hanami dress. My face is beaming right now. You patterns are gorgeous, I think I’ll try the Tinny next, it looks stunning and I think I’m ready for it. As for the printing, yep I knew I must have missed a trick. Thanks for letting me know. I made my own version in the end and I am so pleased. Thanks for the inspiration! Your version is great. I’m so flattered that you were inspired by my hanami dress. Thank you so much.